After we hit the Olympic Sculpture Park, Rakka and I went to the Seattle Aquarium for the first time (she mentioned it here). 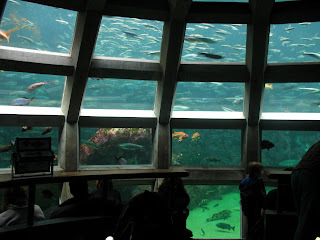 Something you might not know: I love aquariums (as long as they don't have echo locators, but that's another post). I grew up going to the baltimore aquarium, which is huge (but I don't go there anymore (see previous parenthetical aside)). Seattle's is relatively small, but it's full of nice stuff. Local stuff. I saw thousands of these guys (left) at haystack rock in Oregon. The environment at the aquarium is just about exactly the same; they even have a tide simulator. That goes for these other starfish too (right). There are great displays everywhere. Like this circular tank where the coral competes with the fish for the 'most beautiful' title. There's crabs, sea anemones (outside and with tide generators too). I'm not sure how I feel about the salmon spinner though. I mean, I know they have to swim, but maybe they'd like some scenery? Or a sense of movement? The water spins just fast enough so they are swimming in place. Poor guys. And that concludes the tour for today. The tour will continue tomorrow with the octopus. The jellies and the mammals will come after.